You’d be hard-pressed to find two breweries with more upstanding legacies than Weihenstephan and Sierra Nevada. Weihenstephan claims the title of the “world’s oldest brewery,” while Sierra Nevada was one of the pioneers of America’s craft beer movement when Ken Grossman founded it in 1980. Now, in 2018, the two heavyweights have teamed up for a beer that hybridizes what each does best. For Weihenstephan, that’s this beer’s hefeweizen base. Slightly darker in color than the sunny hue I expected, the beer nonetheless gives off hefeweizen’s signature aromas: lots of clove up front (from the yeast), a little bit of lemon pith (from the wheat), and a restrained bubblegum and black pepper note underneath it all (again from the yeast). Sierra Nevada’s contribution is the West Coast hop profile that kicks Braupakt from a traditional, by-the-books hefeweizen to… something else. It wasn’t noticeable to me in the aroma, but once I took a sip of this, the hops crashed onto my tongue like the Kool-Aid man—in a good way. The hop flavors will be familiar to anyone who’s had an American IPA in the past decade: grapefruit skin, zesty spruce, sunny lemon. Those dovetail unexpectedly well with the hefeweizen yeast’s spice to create a synergistic citrus-clove finish that might remind some drinkers of Belgian saison yeast. The whole sip dries out to a refreshing, punctual close. Whether you’re a fan of German wheat beers, American hops, or even Belgian farmhouse beers (seriously, I think saison fans would dig this), keep an eye out for Braupakt. Braupakt, by the way, means a “beer pact,” which is what these two brewing pioneers have forged. Count me in. 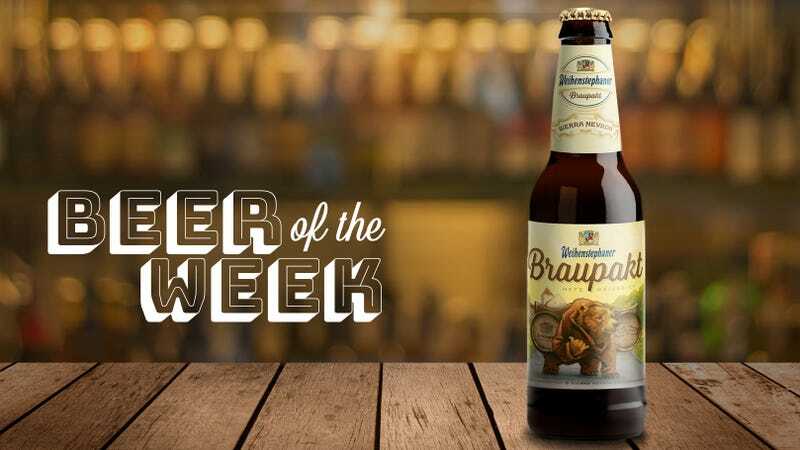 Weihenstephan/Sierra Nevada Braupakt will be available nationally through August, at which time the next collaboration, an Oktoberfest lager, will drop.